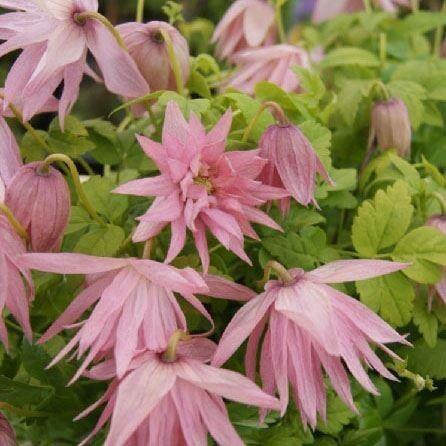 Clematis Country Rose is an award winning new introduction, that produces many flowers and buds and blooms over a long period. The flowers are double and very unusual in appearance. Each one shaded pink flushed pale purple especially at the tips and along veins, hence the name 'Country Rose' as the combination of flower type and colour is truly breath taking when this is seen in full bloom. A compact varieties that will reach around two metres tall, it's perfect for covering a fence or trained over garden structures and through shrubs. Supplied in approx 2-3 litre containers.